Lieutenant Alfred Richard Barton (South African Infantry) is killed. His brother was killed in February and they are sons of the Reverend Alfred John Barton Rector of Strumpshaw. Lieutenant Harry George Elliot (South African Infantry) is killed in action at age 36. He is the son of the late Major ‘Sir’ Henry George Elliot KCMG CB. Second Lieutenant Errol Victor Tatham (South African Infantry) is killed in action at age 24, three days after his brother was lost in the submarine H3. They are sons of Lieutenant Colonel ‘the Honorable’ Frederick Spence Tatham DSO. Private William Arthur McKenzie (South African Infantry) an Australian Rules Footballer is killed at age 36. He played 4 games for Geelong in 1898. Private H C Raphael (South African Regiment) is killed at age 22. His brother will be killed tomorrow. Private Victor Reginald Pattison (South African Forces) is killed at age 19. His brother will be killed next October. Private William R S Bicheno (South African Infantry) is killed at age 24. His brother will be killed next July. Private Charles Henry Stuart (South African Infantry) is killed at age 35 as the middle of the brothers who will lose their lives in the Great War. Lieutenant Eric MacLeod Milroy (Black Watch) dies of wounds at age 28. 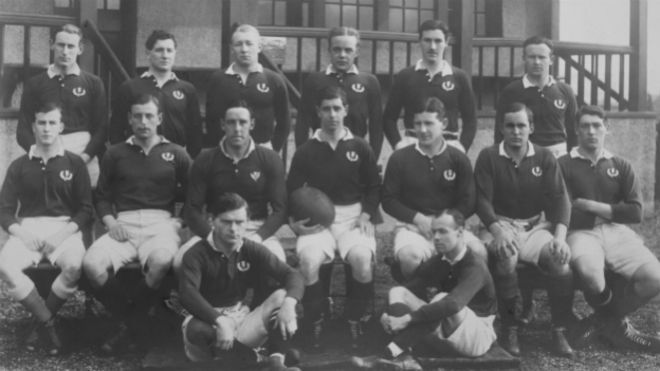 He was the Captain of the Scottish National Rugby Football team in 1914 and earned 12 caps playing internationally. Lieutenant George Fleming (Scots Fusiliers) dies of wounds at age 31. His brother will be killed in March 1917. Lieutenant Norman John Wragg (South Staffordshire Regiment) dies of wounds at age 26. His brother was killed on the first day of the battle of the Somme and they are sons of John Downing Wragg JP. Lieutenant Richard Bagnall Clegg (Royal Engineers) is killed in action at age 23. He resigned his post as Assistant Engineer, Public Works Department, Bombay to enlist. Second Lieutenant Martin Arthur Heathcote MC (Royal Fusiliers) is killed at age 23. His brother will die on service in August of next year. Second Lieutenant Harold Halstead Brown (Gordon Highlanders) is killed at age 19. He is the son of the Very Reverend John Brown. Corporal Leonard Henry Reeve DCM (King’s Royal Rifle Corps) is gassed to death at age 24. His older brother will be killed in one week. Corporal John Charles Salmon (Northamptonshire Regiment) is killed. His brother was killed in the first month of the war. Private Percy Philpott (Bedfordshire Regiment) is killed. His brother died of wounds in April of this year. Gunner Henry Carrodus Mellon (Royal Field Artillery) is killed at age 20. His brothers will be killed in October 1918. Gunner Levi Woodhouse (Royal Field Artillery) is killed at age 27. His son Sergeant Colin Woodhouse (Royal Air Force) will be killed in May 1940 over Germany. Private David Watt (Black Watch) dies of wounds at age 22 on the Sommer. His brother will be killed in October 1918. Private Robert Kennaugh Southward (Manchester Regiment) is killed in High Wood at age 19. He is the son of W C Southward JP. Private George O Sutherland (Australian Infantry) is killed in action at age 20. He is the first of three brothers to be killed in a six-month period. Private John Tocher (Gordon Highlanders) is killed at age 26. He is the second of four brothers who are killed in the Great War. Private William Dolan (Manchester Regiment) is killed at age 26. He is the second of three brothers who are killed in the war including the last who is killed tomorrow. Gunner Henry Carodus Mellon (Royal Field Artillery) is killed at age 20. His brother will be killed in October 1918.